From the airport: Take the Proastiakos train or the Metro train from the airport in the direction of Athens center and get off at the Pallini station (http://goo.gl/maps/TySaf) (duration 15 min roughly). Outside the station on the main road, is the bus stop of the KTEL buses to Nea Makri (direction Marathonas). Get off at Nea Makri and follow the map. ‘Nea Guinea’ has been organizing small wind turbine construction workshops since 2009 and has empowered many people with the knowledge of harnessing power from the wind. The wind turbines built in the workshops are based on the designs of Hugh Piggott, a renewable energy expert living in the off-grid community of Scoraig (Scotland), as described in his ‘Wind Turbine Recipe Book’. These wind turbines can be constructed with the use of common materials, simple manufacturing techniques and basic tools, providing a low cost small wind turbine that anyone can built. Hundreds of homemade small wind turbines have been constructed worldwide using these designs, and have proven to be robust, efficient, easy to maintain and quick to repair. Typical applications of locally manufactured small wind turbines are development projects such as electrification of village communities in the global south, educational projects in universities and schools and sustainability projects such as renewable energy electrification of eco-villages. During this one week course a 600W small wind turbine with 2.4m rotor diameter will be constructed from scratch, using simple raw materials like wood for the blades, steel for the mounting frame and tail, copper wire for the coils and neodymium magnets cast in resin for the generator. The wind turbine will be the product of enthusiastic team work, as we will work in groups focusing on woodworking, metalworking and generator fabrication, along with short breaks to share what we have learned with the whole team. Woodworking will involve hand curving the blades of the rotor using drawknives and spokeshaves, planes and chisels. Metalworking will involve fabricating the steel frame to support the generator, blades and tail, with the use of welding, grinding and drilling techniques. Generator fabrication will involve winding coils, placing magnets, preparing plywood moulds and casting the stator coils and rotor magnet disks into resin. Basic woodworking and metal working skills will be taught during the course, and will enable all participants with enough hands-on experience to complete the wind turbine construction. Although most of the course is practical, aspects of off-grid renewable energy systems will be covered in an introductory presentation emphasizing on different applications such as solar panels, solar pumps, wind and hydro turbines. An introduction to the basic theory of small wind turbine systems will cover important aspects such as the wind energy resource, aerodynamics and blades, electromagnetism and generators, the furling tail system, tower installation and connection to a battery bank. Apart from these short presentations, chances for discussions on the these topics will come up throughout the duration of the course. Site visits to wind turbine installations of Nea Guinea in the area will provide the opportunity to see a complete system in operation, while the maintenance procedure for a homemade small wind turbine will be described and put to practice. During the end of the course, the wind turbine constructed by the group will be installed in one of the sites and a demonstration of the electrical installation will be performed. 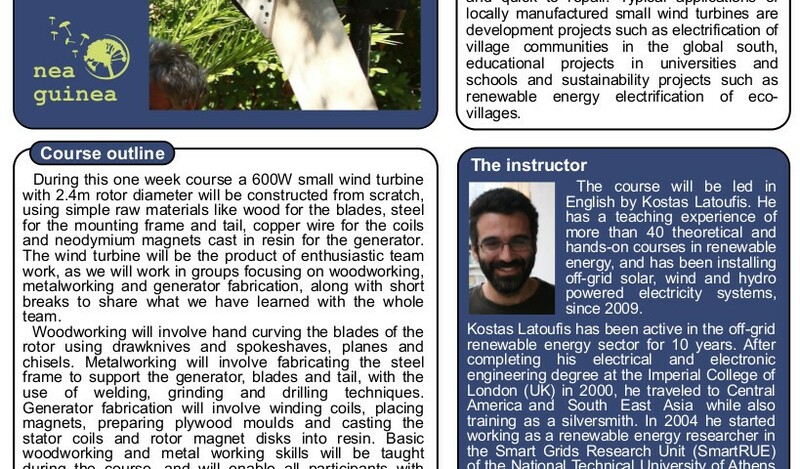 The course will be led in English by Kostas Latoufis. He has a teaching experience of more than 40 theoretical and hands-on courses in renewable energy, and has been installing off-grid solar, wind and hydro powered electricity systems, since 2009. Kostas Latoufis has been active in the off-grid renewable energy sector for 10 years. After completing his electrical and electronic engineering degree at the Imperial College of London (UK) in 2000, he traveled to Central America and South East Asia while also training as a silversmith. In 2004 he started working as a renewable energy researcher in the Smart Grids Research Unit (SmartRUE) of the National Technical University of Athens (NTUA). He started constructing Hugh Piggott small wind turbines in 2007 with the F.A.R.M.A. 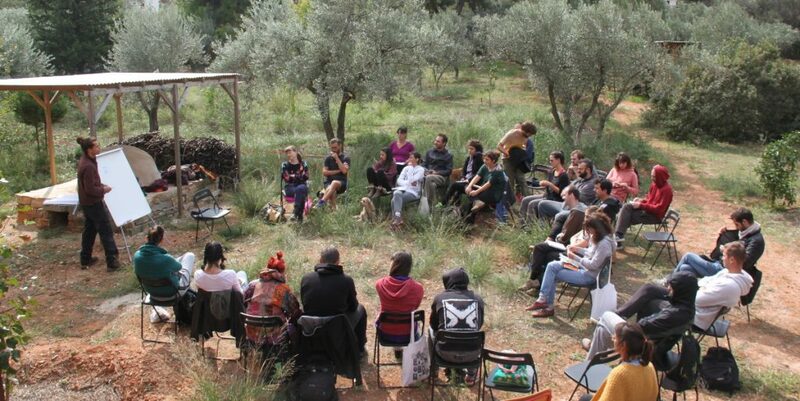 collective and continued with educational construction courses for students, in the Rural Electrification Research Group (RurERG) of the NTUA. In 2009, he co-founded the Nea Guinea not-for-profit organization, with which he has organized many small wind turbine construction courses, building windmills with rotor diameters from 1.2m to 4.2m, and many solar panel and pico-hydro construction courses. While working with Nea Guinea, he has carried out several off-grid renewable energy installations in permaculture farms in Greece and in rural development projects in Central America and East Africa. He is currently a member of the executive board of the Wind Empowerment association, a global network for the promotion of locally manufactured small wind turbines, and he is also pursuing a PhD in the NTUA on the same topic. 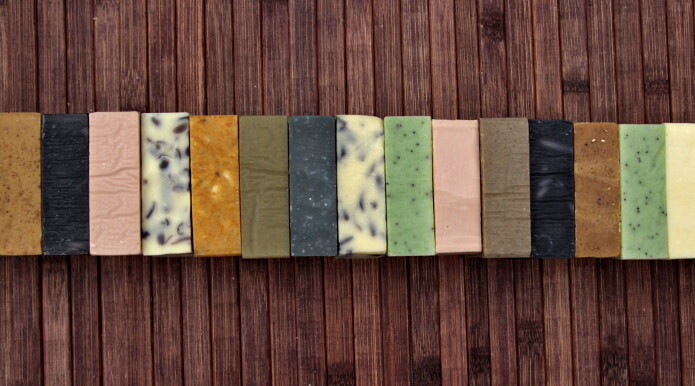 He has been running his own renewable energy company called Element Engineering. – Wind turbine construction Party! 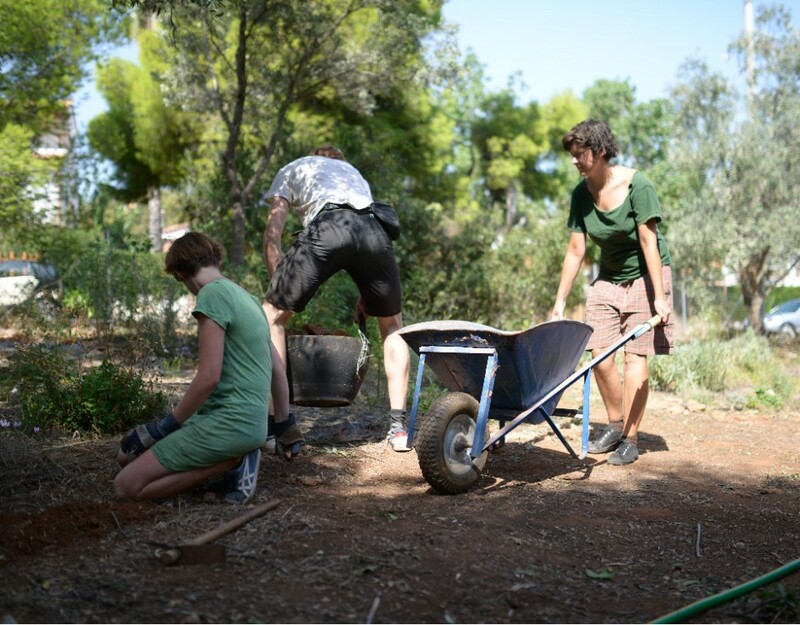 The course is ideal for people practicing permaculture design as it is a specialist renewable energy course focused on small scale windelectric systems. 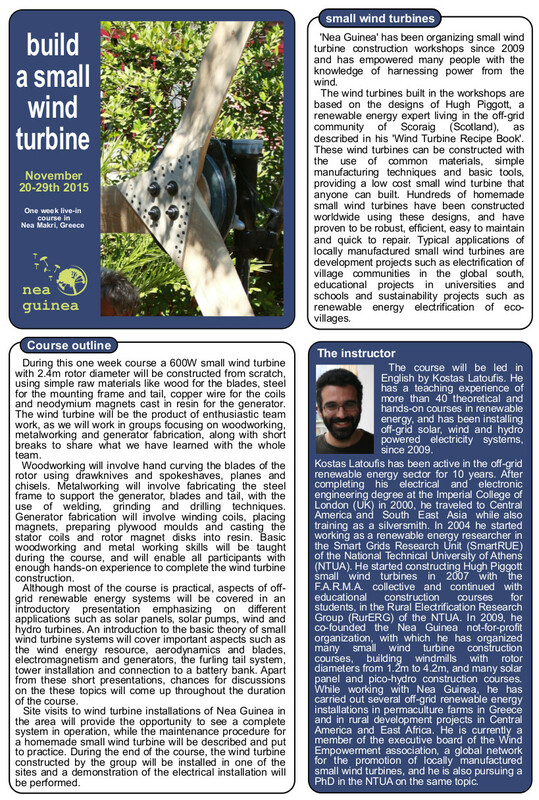 It is also a course for hobbyists and those interested in do-it-yourself renewable energy constructions. The course is intended to be suitable for all levels of experience and abilities, so no prior theoretical or practical knowledge is required. 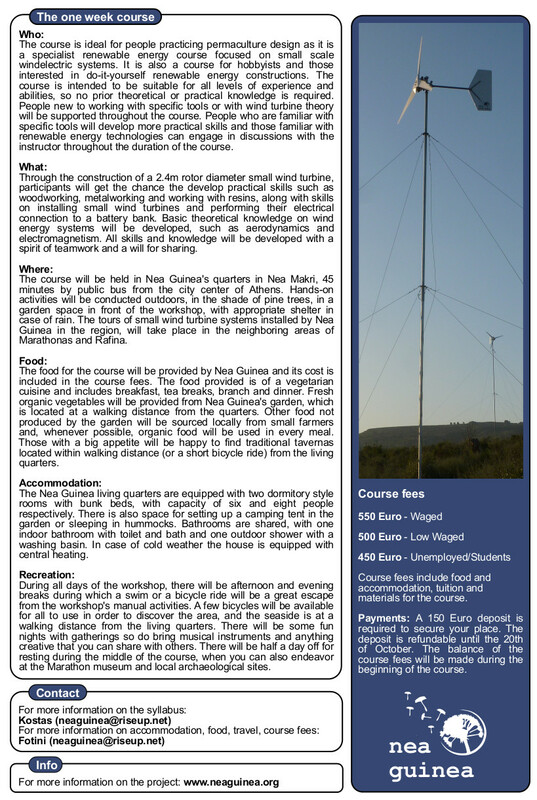 People new to working with specific tools or with wind turbine theory will be supported throughout the course. People who are familiar with specific tools will develop more practical skills and those familiar with renewable energy technologies can engage in discussions with the instructor throughout the duration of the course. 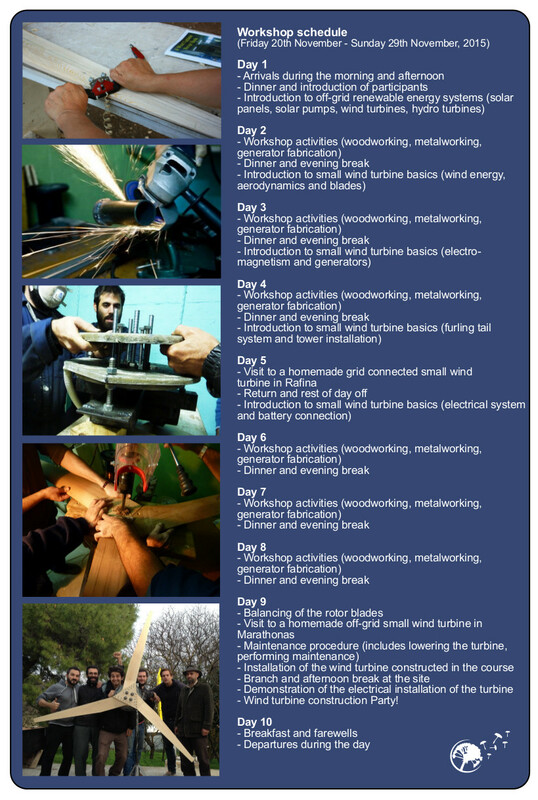 Through the construction of a 2.4m rotor diameter small wind turbine, participants will get the chance the develop practical skills such as woodworking, metalworking and working with resins, along with skills on installing small wind turbines and performing their electrical connection to a battery bank. Basic theoretical knowledge on wind energy systems will be developed, such as aerodynamics and electromagnetism. All skills and knowledge will be developed with a spirit of teamwork and a will for sharing. 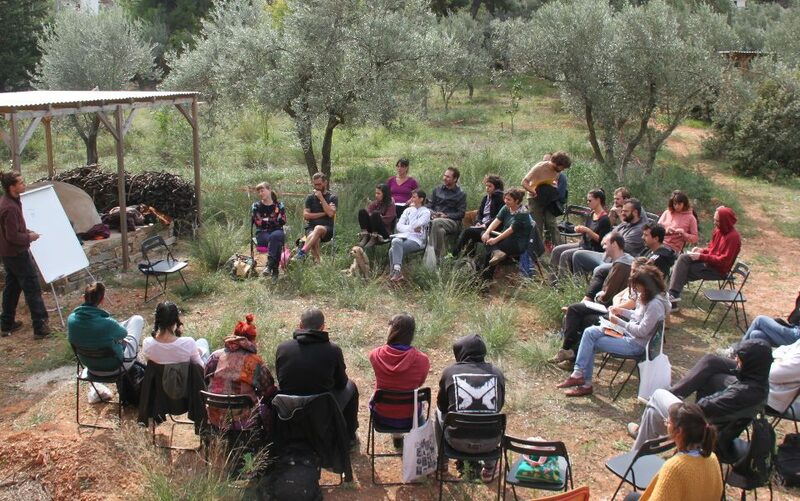 The course will be held in Nea Guinea’s quarters in Nea Makri, 45 minutes by public bus from the city center of Athens. 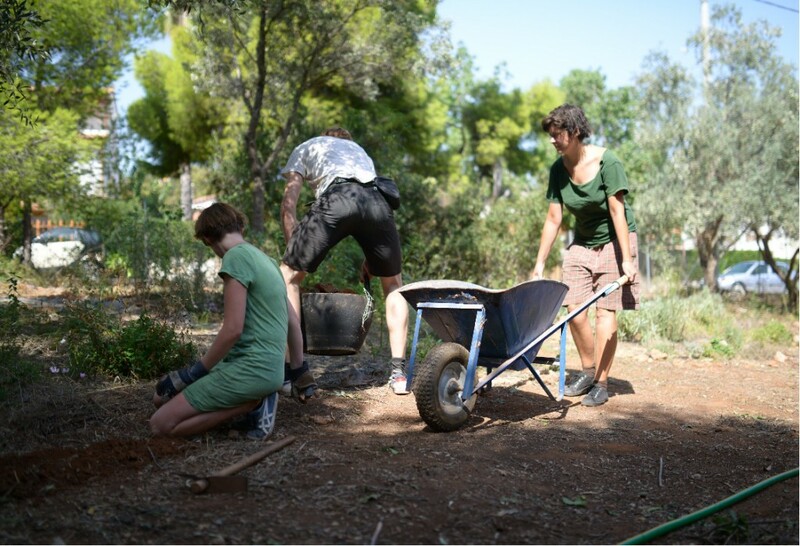 Hands-on activities will be conducted outdoors, in the shade of pine trees, in a garden space in front of the workshop, with appropriate shelter in case of rain. The tours of small wind turbine systems installed by Nea Guinea in the region, will take place in the neighboring areas of Marathonas and Rafina. The Nea Guinea living quarters are equipped with two dormitory style rooms with bunk beds, with capacity of six and eight people respectively. There is also space for setting up a camping tent in the garden or sleeping in hummocks. Bathrooms are shared, with one indoor bathroom with toilet and bath and one outdoor shower with a washing basin. In case of cold weather the house is equipped with central heating. During all days of the workshop, there will be afternoon and evening breaks during which a swim or a bicycle ride will be a great escape from the workshop’s manual activities. A few bicycles will be available for all to use in order to discover the area, and the seaside is at a walking distance from the living quarters. There will be some fun nights with gatherings so do bring musical instruments and anything creative that you can share with others. There will be half a day off for resting during the middle of the course, when you can also endeavor at the Marathon museum and local archaeological sites. Payments: A 150 Euro deposit is required to secure your place. The deposit is refundable until the 20th of October. The balance of the course fees will be made during the beginning of the course.